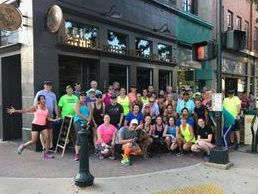 Welcome to the Greensboro Running Club! What is the Greensboro Running Club (GRC)? The Greensboro Running Club is a non-profit organization that was started in 1976 by three dedicated runners. 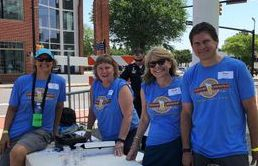 The Greensboro Running Club is a non-profit organization started in 1976 that promotes running, fitness, and a healthy lifestyle within Greensboro and surrounding areas. We are an inviting and inclusive club that seeks to provide opportunities for beginning and experienced runners and walkers to meet and participate in activities together. We recognize fitness as a family quest and encourage family membership. We also give back to the community through donations to worthy causes and service activities. Everyone has their own reasons for joining, but our goal is to promote running and fitness in the Triad area through a variety of running and fitness related activities. What does the GRC do for the community? Each year, the GRC gives back to the community in a number of ways. Annual monetary donation to the Cone Health Mammography Scholarship Fund. What does the GRC do for the running community? We have had a big impact over the past year in the running community. Beginning in 2016, we held one eight week run series. We have since grown and expanded to four, eight week themed run series per year. Runners meet at different locations all over Greensboro, High Point and Oak Ridge which gives them more running options. Check out our calendar for dates and locations. We also offer our annual and very popular "Running of the Lights" series which runseach Tuesday between Thanksgiving and Christmas in beautiful Sunset Hills. 2019 will mark the 14th year for our Women's Running School. A 10 week training program that is usually attended by 150-200 women as they train for the Women's Only 5K Race in October. Our relatively new Men's Running School has been expanded to 8 weeks and is a training program for men running the Zero Prostate 5K race in November. We also give back to the community through donations to worthy causes and service activities. What social events does the club offer? The club offers many social activities. So far this year, we offered discount registration for any member that wished to join a team for the St. Valentine Massacre Marathon in February. We hope to continue to offer more of these team runs to our members. We are planning a Cinco de Mayo 5K and 1 mile "Fun Run" on May 4th, a family picnic at Bur-Mil Park on June 8th, Dan River Tubing in July, a Grasshoppers baseball game in August, a hike at Hanging Rock in the fall, Annual Fall Fashion Show in November and our Christmas party in December. What other benefits do members receive? Plus, you never know when we might throw in a few other “over the top” perks.